Making a difference for special needs children and families in Illinois. Rhonda has partnered with Specialized Care for Children in her role as a speaker for Family Matters Parent Training and Information Center (PTIC) in the northern region of Illinois. Rhonda, who also provides advocacy services for children through the Educational Access Project for the Illinois Department of Children and Family Services at Northern Illinois University, became active in child advocacy when her daughter, Betsy, was born 34 years ago. “With multiple disabilities and interacting with multiple systems, I was made aware that without advocacy, Betsy would not get the help she needed,” said Rhonda, who blends stories from her personal experiences during her presentations at Specialized Care for Children’s monthly parent support group meetings. Dr. Childers has been creating beautiful smiles in southern Illinois for 25 years. The owner of Childers Orthodontics, he works with Specialized Care for Children staff to meet the needs of children with special orthodontic challenges, providing them with a positive transformation that has life-long effects. A firm believer in professional collaboration and giving back to the community, Dr. Childers – born and raised in Marion, Illinois, founded the southern Illinois chapter of Smile for a Lifetime (S4L), a non-profit organization that provides orthodontic treatment to patients who would otherwise not be able to receive orthodontic care. He also offers academic scholarships each year to students in southern Illinois. Dr. Childers has greatly enriched the children and families he serves through his compassionate care. Lindsey has worked at Lurie Children’s Hospital of Chicago for 14 years, including the past three years as Nurse Coordinator for the Pulmonary Habilitation Program and Transitional Care Unit. In this role, Lindsey coordinates training for caregivers of chronically ventilated patients and serves as the primary liaison between patients and their families, Specialized Care for Children Care Coordinators (CCs), providers, staff nurses, respiratory therapists, support services, home care agencies, and home equipment companies. Named the 2014 recipient of Lurie Children’s Hospital’s Nurse Exemplar Award (Family Educator), Lindsey works closely with Specialized Care for Children’s Chicago Home Care team, providing timely information and crucial support at the hospital. Nancy is Director of TeleHealth in the McHenry County Office of the Epilepsy Foundation of North Central Illinois, Iowa, and Nebraska. She has partnered with Specialized Care for Children to connect children with epilepsy and their families to services in the community. Deeply rooted in the Foundation since 1998, Nancy has received numerous honors for her fervent advocacy efforts, including National Advocate of the Year (National Epilepsy Foundation), Chicago Volunteer of the Year (Chicago Epilepsy Foundation), and the Motorola Inc. TEAM Award. She is also one of the three founding members of Citizens United for Research in Epilepsy (CURE), which has raised over $10-million for epilepsy research. SJN Electric, located in Swansea, Illinois, has been essential to the well-being of numerous medically fragile and technologically dependent children in the Metro-East area. SJN Electric provides the necessary electrical modifications and system upgrades to support the technology needs of children served by Specialized Care for Children, Home Care Program. Owned by Steven Neumeyer, SJN has traveled great distances to provide services – including a trip that was more than two hours one-way – to assist with a family’s electrical needs. Without SJN’s dedication and willingness to serve these families, many children would require extended hospitalizations or re-hospitalizations, potentially further exacerbating their illnesses. 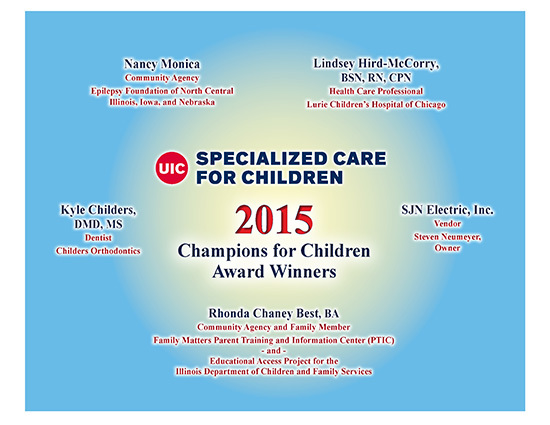 You can also read about the 2015 Champions for Children honorees in the story published on the UIC News website here.